Whether the NYC police angle is true or not (it’s being hotly disputed), Facebook and Google are thinking along lines that follow the whims of the Chinese Government. SenseTime and Megvii won’t just be worth $5 Billion, they will be worth many times that in the future. This is because a facial recognition data-harvesting of everything is the future of consumerism and capitalism, and in some places, the central tenet of social order (think Asia). China has already ‘won’ the trade-war, because its winning the race to innovation. America doesn’t regulate Amazon, Microsoft, Google or Facebook properly, that stunts innovation and ethics in technology where the West is now forced to copy China just to keep up. In 1995, left-wing academics Richard Barbrook and Andy Cameron detailed the philosophy and ideas of the new tech wunderkinds, christening it “The Californian Ideology.” This ideology represented a fusion of the cultural bohemianism of San Francisco and entrepreneurial free market zeal. All you needed to get to utopia was a belief in “disruption,” the idea that progress is achieved through smashing up old industries and institutions and replacing them with something new and digital. Money and ideas in Silicon Valley have a very complicated relationship. Silicon Valley runs according to a Faustian pact: money in exchange for world-changing ideas. Over the years, the big tech firms have very carefully cultivated the Californian Ideology. Even though they are massive multi-billion-dollar corporations with huge PR teams, they pitch themselves as anti-establishment.The worse these companies behave and the richer they become, the more they spend on looking cool and talking about fairness and community. And to whom do we look in order to solve our collective social problems? It’s no longer the state, but the modern tech-geek superhero. Total victory for the monopoly is not over economics or politics. It’s over assumptions, ideas and possible futures. In his book Tell Everyone: Why We Share and Why It Matters, Alfred Hermida states, “People are not hooked on YouTube, Twitter or Facebook but on each other. Tools and services come and go; what is constant is our human urge to share.”1 Libraries are places of connection, where people connect with information, technologies, ideas, and each other. As such, libraries look for ways to increase this connection through communication. 1. What social media platforms are students using? 2. 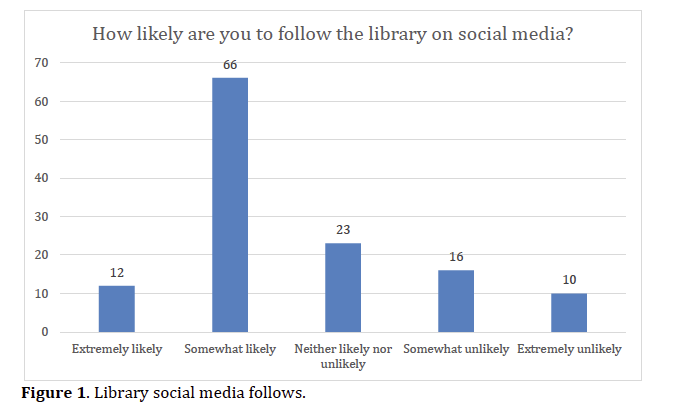 What social media platforms do students want the library to use? 3. 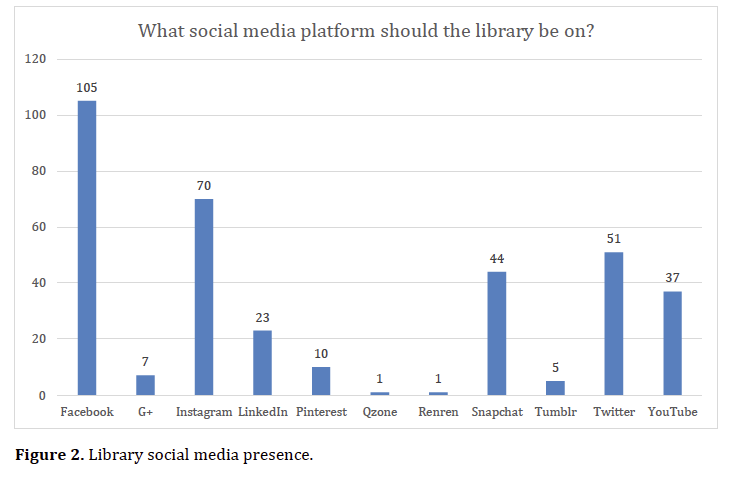 What kind of content do students want from the library on each of these platforms? The second survey also lasted for three weeks starting in mid-April of the spring 2017 semester. As a participation incentive, students who completed the initial survey and the second survey had an opportunity to enter a drawing for a $25 Visa gift card. we intend to develop better communication channels, a clear social media presence, and a more cohesive message across the Purdue libraries. Under the direction of our new director of strategic communication, a social media committee was formed with representatives from each of the libraries to contribute content for social media. The committee will consider expanding the Purdue Libraries’ social media presence to communication channels where students have said they are and would like us to be. Oculus Connect, starting Wednesday in San Jose, California. Facebook’s Oculus VR division promises discussions on how health care, movies and video games are adapting to this still nascent technology. One panel will explore how the disability community can benefit from VR gear and presentations. Facebook chief competitors, Sony and HTC, followed suit. The PlayStation VR dropped to $400 from $500, and the Vive dropped to $599 from $799 all in the past three months. Survios made Raw Data more widely available for Oculus, Vive and PlayStation VR. Survios is also looking beyond VR for customers, redesigning Raw Data to work in arcades as well. Over the summer, Apple and Google announced new technologies called ARKit and ARCore, respectively, that are designed to help iPhones and iPads or any device powered by Google’s Android software marry computer-generated images with the real world. A $2.99 app, Star Guide AR, highlights stars and constellations in the sky once you point your phone at them. Another, Ikea Place, previews furniture in your home with a tap. Walk around your living room and you can see the furniture you placed while looking through the screen on your phone. So far, both are available only for the iPhone. App developers I spoke with say they’re excited by augmented reality and believe it may help spur people to buy VR systems as well. Microsoft’s focusing on both AR and VR. In an October update to its Windows 10 software for PCs, the company is partnering with device makers like Lenovo, Dell, HP, Acer and Samsung to create headsets based on its designs. They’ll sell for as little as $300 each when they begin hitting store shelves Oct. 17. Five higher ed leaders analyze the hottest trends in education technology this year. new forms of human-computer interaction (HCI) such as augmented reality (AR),virtual reality (VR) and mixed reality (MR). combining AR/VR/MR with cognitive computing and artificial intelligence (AI) technologies (such as machine learning, deep learning, natural language processing and chatbots). Will remote workers be able to be seen and interacted with via their holograms (i.e., attending their meetings virtually)? What would this mean for remote learners? How do/will these new forms of HCI impact how we design our learning spaces? Will students be able to pick their preferred learning setting (i.e., studying by a brook or stream or in a virtual Starbucks-like atmosphere)? Will more devices/platforms be developed that combine the power of AI with VR/AR/MR-related experiences? For example, will students be able to issue a verbal question or command to be able to see and experience walking around ancient Rome? Will there be many new types of learning experiences,like what Microsoft was able to achieve in its collaboration with Case Western Reserve University [OH]? Its HoloLens product transforms the way human anatomy can be taught. p. 22 Extensive costs for VR design and development drive the need for collaborative efforts. Case Western Reserve University, demonstrates a collaboration with the Cleveland Clinic and Microsoft to create active multi-dimensional learning using holography. the development of more affordable high-quality virtual reality solutions. AR game developed by the Salzburg University of Applied Sciences [Austria] (http://www.fh-salzburg.ac.at/en/) that teaches about sustainability, the environment and living green. Whether using AR for a gamified course or to acclimate new students to campus, the trend will continue into 2017. This virtual reality field trip tool works in conjunction with Google Cardboard and has just been officially released. The app allows teachers to guide students through an exploration of 200 (and growing) historical sites and natural resources in an immersive, three-dimensional experience. The app only works on Android devices and is free. This app works in conjunction with Google Sheets and allows teachers to easily make a Jeopardy-style game. This Android app allows users to do science experiments with mobile phones. Students can use sensors in the phone or connect external sensors to collect data, but can also take notes on observations, analyze and annotate within the app. a database of YouTube Channels by subject to help educators with discoverability (hint subjects are by tab along the bottom of the document). This freemium tool has a lot of functionality in the free version, allowing students to view different parts of human anatomy and dig into how various body systems work. This app has less power than Photoshop, but is free and fairly sophisticated. It works directly with Google accounts, so students can store files there. This extension to the Chrome browser lets kids play with digital blocks like Legos. Based on the computer’s IP address, the software assigns users a plot of land on which to build nearby. There’s a Build Academy to learn how to use the various tools within the program, but then students can make whatever they want. Built on Scratch’s programming language, this easy tool gives step-by-step instructions to get started and is great for the hesitant teacher who is just beginning to dip a toe into coding. The competition narrows down between Microsoft HoloLens, Facebook Oculus and Google Glass. Each of them bets on different possibilities, which wearable bring.